I’m a Meals on Wheels volunteer in Durham. I take an early lunch on Fridays and take dinner (the southerner’s idiom) to ten homes. It’s a sixty to ninety minute commitment each week. My route is comprised of elderly or convalescing folks. They get a hot meal and have someone to check on them each day. It’s a wonderful service for over 200 people in the Bull City. And as the saying goes, “you get more than you give.” There’s more on that topic below, but my main point is about Christmas...or maybe it’s Chanukah. Meals on Wheels is closed on major holidays; that includes Christmas. In Durham, while the staff and volunteer core get a break, a Jewish congregation has stepped up to cover the holiday meal. Judea Reform Congregation on West Cornwallis Road has volunteered to prepare and deliver meals on Christmas Day. That seems profoundly ecumenical to me. At the heart of our social action work is a commitment to bring into practice the core social justice values of Judaism and to pursue tikkun olam - repairing the world - through individual and group action. maintain the rights of the poor and oppressed. Let’s commit to some repair work in 2009. You don't have to take on an entire continent. Start small. Take a meal to someone each week in your own community. Meals on Wheels is just a click away. 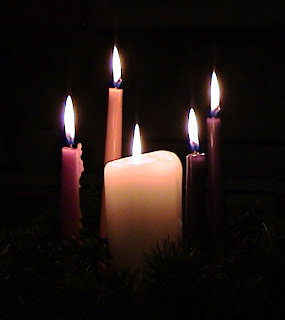 Click here to view WRAL TV5's Christmas Day story on Judea Reform Congregation. I do an MOW route every week in Durham. It takes a little over an hour. I typically deliver to ten homes. It has helped me learn about every corner of Durham, and it takes me out of my “corporate comfort zone.” I think that’s a good thing. It’s so much more than just delivering a meal. I see the problems “old folks” face who are determined to remain in their homes. I get to practice “patience” waiting at the door for people using walkers or trying to converse with someone who has pretty much lost their hearing. I’ve watched families deal with Alzheimer’s. I get a snapshot of urban poverty. And I’ve been inspired by the faith of several seniors in their struggles with terminal cancer. I may not have painted a pretty picture, but I assure you I get much more than I give from that simple act of delivering a meal. I’ve thought about making it mandatory for my managers. Everyone could spare a lunch hour for this experience. More business folks could squeeze this into their weekly routine! 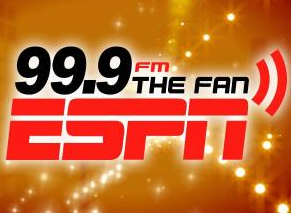 In my last post I wrote about our sports-talk radio station (99.9 fm - The Fan) and sports website (wralsportsfan.com). In this dispatch I want to explain why sports is so important to Capitol Broadcasting Co., and it goes beyond my personal fandom. The Triangle is sports crazy! A professor of marketing might say this represents a significant psychographic of our community. This fall Sporting News magazine ranked Raleigh-Durham-Chapel Hill as the 24th best sports market in America. That’s pretty remarkable considering we have only one major league team, the NHL Carolina Hurricanes. (And I’m obliged to plug our own Durham Bulls - the most famous and among the best attended minor league teams in the nation.) But the truly remarkable feature of our community is the three universities affiliated with the Atlantic Coast Conference. Three major institutions. Three major NCAA Division I sports programs - in one market. The University of NC, Duke and NC State University enroll thousands of students, maintain strong alumni associations and are among North Carolina’s largest employers. 72,000 students are enrolled in the three universities that employ more than 80,000 people. Fold in the local membership of booster clubs and alumni associations and more than a quarter of a million people maintain strong associations with one of the three schools. More than 1.7 million people will attend a college sporting event in the Triangle this year. That’s like relocating a mid-tier NFL, NBA and MLS franchise to the Raleigh-Durham market. I repeat: The Triangle is sports crazy - a great sports market! More evidence: We engaged the Raleigh-based communications firm French West Vaughan to measure ACC fanaticism. Like a sports anthropologist, FWV combed through myriad cultural relics, ie, the firm reviewed television viewership across ACC markets in the Southeast. The Triangle shows clear dominance in terms of household ratings. 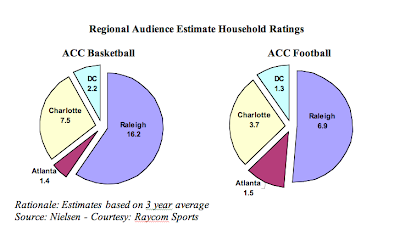 According to Nielsen research data, the year-over-year household ratings for ACC sports in the Triangle market outpace the ratings in Charlotte, Atlanta and Washington DC combined. The affinity for college basketball in the Triangle is well known nationwide, but how does the fanaticism of RDU rivalries compare to local competition in other parts of the country? French West Vaughan examined Nielsen data for four big rivalry games in different regions, Raleigh-Durham, Atlanta, Los Angeles and Cincinnati. 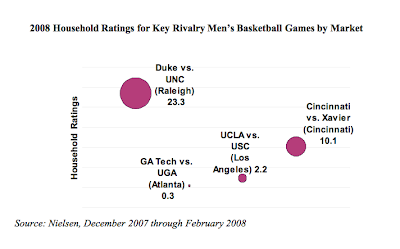 The Duke vs. UNC game pulled a 23.1 household rating in Raleigh-Durham. The next highest game measured was Cincinnati vs. Xavier with a 10.1 rating in Cincinnati. UCLA vs. USC carried a 2.2 rating in Los Angeles. In Atlanta, the GA Tech vs. UGA rivalry only received a 0.3 household rating. Did I fail to mention: The Triangle is sports crazy!?! And Capitol has it covered: Radio - TV - Web - Mobile...with marketing opportunities across the entire platform. Shoot me an e-mail. I've got more info for you on our Sportsfan Marketing Group. We’ve teamed up with the sports juggernaut, ESPN, “the Worldwide Leader in Sports.” On Monday, December 1st at 6am, our sports-talk station, 99.9 FM The Fan, became ESPN Radio’s Triangle affiliate. ESPN’s top talent, high profile guests, analysis, reporting and play-by-play will compliment our afternoon local shows and Carolina Hurricanes coverage. The affiliation gives The Fan access to ESPN’s college hoops luminaries like Jay Bilas, Hubert Davis and Dickie V - fuel for the hardwood fire that gets us through the winter in these parts. With ESPN we add MLB and NBA play-by-play to The Fan’s line-up. With our existing Westwood One affiliation we have the NFL and college football and basketball. What a package! 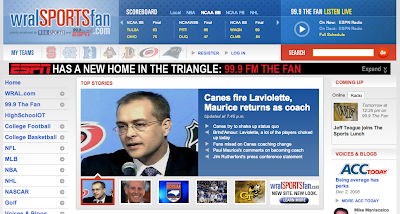 On the web we have redesigned and renamed our sports web site – wralsportsfan.com. Breaking sports news. Radio interviews from The Fan. Video from the WRAL TV5 Sports Department. This is THE website for your on-demand sports fix. Listen to a compelling radio interview while you check your e-mail, read an insider’s blog or view an endless menu of video clips from coaches and players. 99.9 fm. Is it one of your presets? Thanks. We appreciate your patronage. The Durham Bulls have a rich history dating back to 1902, but there are some gaps in the time-line. Play was suspended during World War I, the Depression and during much of the 1970s. WWI and the 30s – that makes sense – but what happened in the 70s? Rusty Staub, Joe Morgan and Greg Luzinski played for Durham in the 1960s, but the team was on life support by the end of the decade. In 1968 the Durham and Raleigh teams merged. This early attempt at “regionalism” was a bust. The team folded in 1971 running a newspaper ad inviting its paltry fan base to “the final game in a long, disastrous, just plain awful season.” That is truth in advertising! The baseball landscape was not a pretty picture in our region - no local baseball and the Carolina League had downsized to only four teams. ...and that brings me to Jim Mills, the former Carolina League President who passed away on November 14th at eighty-nine. He had much to do with the Bulls' renaissance. Jim worked aggressively to expand the CL to eight teams. As part of that plan he aided and abetted the Bulls' return to Durham. Entrepreneur Miles Wolff deserves full credit for reviving the team in 1980 as a Atlanta Braves affiliate, but Jim was a behind-the-scenes force lending expertise and credibility to all aspects of the resurrection. The CL was taking in a new team, the Braves were adding a farm club and the City of Durham had to be persuaded to fix up the old Durham Athletic Park. Jim worked alongside Miles to get all of that done. Jim was his bench coach. And what an outstanding outcome: the Carolina League is considered the premier single-A league and the Bulls are the most renowned club in the minors. Later in his career Jim worked in the Bulls' front office. He was a fixture at the DAP, and he served as consultant to Capitol Broadcasting Co. when we purchased the team in 1991. In retirement, he visited us each summer in the new ballpark, and we enjoyed his company. Please read Jim's obituary and this news story. He's in the NC Sports Hall of Fame and NC High School Athletic Association’s HOF. 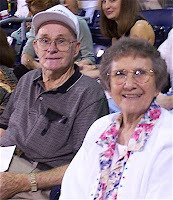 Our thoughts and prayers are with Jim's wife of sixty-three years, Flossie, and their family. He lived a full and interesting life. I'm thankful the Lord gave him extra innings! The game of baseball has an unfortunate connection to the neurodegenerative disease ALS…or Amyotrophic Lateral Sclerosis…or Lou Gehrig's disease. It claimed the life of the Yankee legend, and the disease bears his name - a dubious honor. 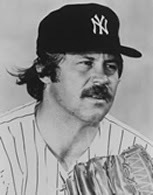 In the modern era, ALS afflicted NC native and Hall of Famer Jim “Catfish” Hunter who died in 1999. That brings me to another connection. The Durham Bulls’ support the NC chapter of the ALS Association, the Jim "Catfish" Hunter Chapter, based in Raleigh. I’m on the chapter board, and we received some very good news this week. On November 13th the ALS clinic at Duke University Medical Center was recognized as a Center of Excellence by the national ALS Assn. Congratulations to Dr. Richard Bedlack and his team. They provide care to over 300 ALS patients, and the clinic works closely with our chapter. We’re collaborating to improve care for patients in central and eastern NC. Duke, named one of America’s best hospitals in 2008 by U.S. News & World Report, has been important to that strategy. The ALS Association’s Jim “Catfish” Hunter Chapter in North Carolina works very closely with the clinic and has helped the clinic grow from one physician and physical therapist to include a nurse practitioner, an additional physical therapist, occupational therapist, speech therapists, assistive technology specialist, a neuropsychologist, respiratory therapist, equipment vendor and nurse. The team received a major boost when a full time coordinator and social worker joined the staff. Beyond the Bull City, Dr. Bedlack and Duke have been unselfish and generous in helping the chapter establish a new clinic at Pitt County Memorial Hospital. The ribbon cutting was September 26th. Now, ALS patients in eastern NC won't have to travel to Durham for treatment. NC has two other clinics: In Charlotte, the MDA/ALS Center at Carolinas Medical Center. In Winston-Salem, the Wake Forest University Baptist Medical Center’s ALS Clinic, another Center of Excellence. ALS is a terrible disease. No known cause. No known cure. But these centers are on the frontline with compassionate care and research. Check out the Jim "Catfish" Hunter Chapter. We need your support! Ben was a corporate VP for two decades. He retired in 2003. The best of CBC’s senior executives never truly retire, and Ben was still working on various projects for the company. For most of his career Ben was the “implementer-in-chief” for just about everything CBC did in the community. He was organizer, convener, funder and fundraiser. Jack-of-all-trades. Man for all seasons. The clichés are apropos. He was meticulous (constantly reminding our beneficiaries that Capitol is spelled with an O, not an A in that last syllable,) wise and sociable. The latter brings me to the most serious topic of “building corporate culture through golf” – Ben’s unheralded contribution to Capitol and his (slacking?) coworkers. He loved golf and used his position to spread the joy. We grieve with Martha, Kimberly and their entire family. Surely, Ben’s enjoying an adult beverage at Heaven’s 19th Hole, and we raise our glass in his honor and to his memory. Edy is Director of the Ten Year Plan to End Homelessness and Lanea is a Resource Specialist. I’m impressed with their passion and organizational skills. They had dozens of social service providers collaborating with hundreds of volunteers from RNs to social workers to lawyers. This was a one-day-in-one-place event designed to connect homeless people with a broad range of services to stabilize their living conditions. The organizers wanted to use the ballpark as a drawing card to avoid the stigma of a homeless shelter. Edy initially described it as giant triage center, and that’s how they put the three acre DBAP to use. Over 250 people took advantage of the services: employment, mental health, medical testing, dental. Some folks simply needed to make a phone call or get a bus pass. Many “street people” have pets, and they even provided veterinary services. …another shout-out to Jamie Jenkins and Tammy Scott with CenterPlate for preparing the meal…to House of Raeford for the fresh turkeys, Sysco for veggies and fruit, Durham Rescue Mission for the desserts and Pepsi…to the Interfaith Food Shuttle for planning the menu and donating fresh produce from their warehouse. • 1,115,000 people (13.2% of the population) experience food insecurity in North Carolina. • From the work we do with children who receive free or reduced school lunches, we know that in the Triangle there are 91,000 children who are food insecure. • In Durham: 34,930 (14.9%) live in poverty. 11,565 (19.7%) children live in poverty.